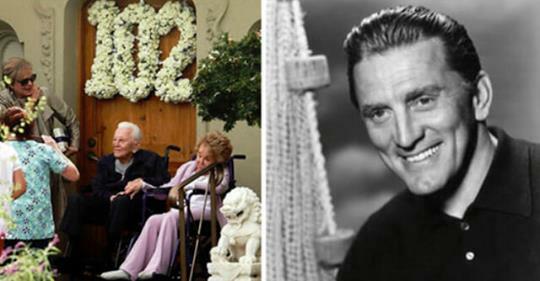 Kirk Douglas is one of the world’s most iconic actors and is considered one of the last surviving stars of the film industry’s Golden Age. He was born with the name Issur Danielovitch in Amsterdam, New York, to parents who immigrated from Russia and spoke Yiddish at home. His eventual autobiography was named “The Ragman’s Son”. This legendary man recently celebrated his 102 birthday with his family and his wife, Anne, 99. The city of Amsterdam celebrated his birthday by unveiling a historic plaque marking the house where he grew up, and fans, relatives, and friends gathered at the corner of Eagle and East Main streets, where the historic marker will be placed, once a pole is made available for it. Kirk also had a big birthday party, and he and his wife sat in matching wheelchairs as their caretakers ensured everything was in order for the celebration. They were married since 1954 and had two sons – Peter, 63, and Eric, who died tragically of an accidental drug overdose in 2004 at the age of 46. This tragedy made them determined to raise awareness about such cases, and it culminated in an honor bestowed by Columbia University’s Center on Addiction and Substance Abuse’s Inspiration Award. In 1996, Douglas suffered a debilitating stroke in 1996, which impaired his ability to speak, and forced him to suspend his career. However, as his son, actor Michael Douglas, confirmed, he didn’t give up and continued working with his trainer. Among the family that celebrated his birthday was his son from his first marriage, actor Michael Douglas, and daughter-in-law actress Catherine Zeta-Jones. On Instagram, Zeta-Jones posted a moving video of Kirk dancing with her son, while her daughter played piano and sung in the background. His granddaughter Carys posted a throwback photo of Kirk in his younger days, with a caption full of love and affection. Coca-Cola introduced the formula that it uses until the present day. We also wish him a happy birthday and many more to come!